This tour is a TOTAL BLAST! 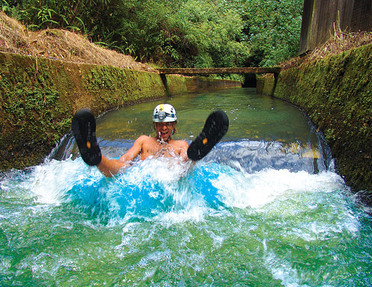 Enjoy the beautiful scenery of this old world sugarcane plantation from the cool comfort of your cushy inner tube. The irrigation ditch built in 1870 weaves and winds a picturesque trail though a tropical rain forest, volcanic mountains, waterfalls, rivers, and a bamboo forest. After check in, travel in a recreational van with hilarious guides up to a 17,000 acre agriculturally zoned, private property so remote that less than 7% of the locals will ever visit it. When you close your eyes and think about what Hawaii is supposed to look, smell and feel like, this is where your mind goes. This tour will fulfill anyone’s expectations from small children all the way up to grandma. 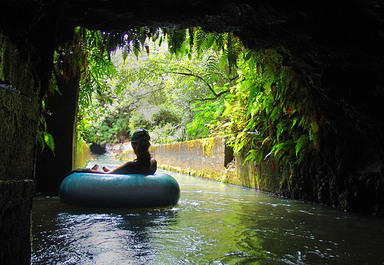 Practically anyone can join in and everyone will have an amazing time floating on large soft inner tubes through 5 caves. At the end you'll have a delicious build- it-yourself picnic lunch. Bathing suit, towel, sunscreen, water shoes (available for rent for $3 at check in if you need some) waterproof camera with strap or clip. No pregnancies. No children under 5 years old. Must be at least 43 inches tall. Weight limit 300lbs. Big soft inner tubes, helmets with lights, a picnic lunch and beverages.